This adorable little shop, tucked away on Elizabeth street is filled with just enough pieces of Holly’s frilly, girly, but still grown-up, line. The sale consisted of summer samples and stock all marked down quite impressively. Bright summer flats and mules were down to $85- $120 (from $345 and up!). Dresses were $90- 295 (from $495-$995!). But the most exciting news of all is that the prices are STILL being marked down! Starting next week, they will continue to drop up to 85% of their original retail price. I’m not sure if I could rock all of the pineapple-themed frocks and accessories (a little too Carmen Miranda for me). But I absolutely adored the sweet sun dresses and funky rafia adorned sandals. This is the perfect opportunity to stock up on last minute summer gear (you know you are SO over everything in your closet right now- at least I am anyway), and to pick up some tres chic pieces for your tropical getaway this fall (St. Tropez? Fiji? Disney World?) when you’ll need something fabulous and easy, breezy to ruck amuck in. There were even some things that could definitely be transitional- wear bare now, or with tights and a cardigan later. My shopping bag is empty for now, but I will definitely score some once the sale hits it peak. 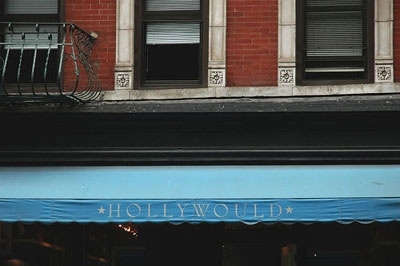 Make sure to check out the websale at hollywould.com before you head all the way down to Nolita. But if you do head down, don’t forget to stop at Pinkberry around the corner! Yum!